This book will quickly, efficiently--and above all, effectively--help students prepare to succeed on the AP World History exam. Right from the start, students will identify the course topics they most need practice on, allowing them to focus their study efforts on areas in need of improvement while also reviewing their general subject knowledge. PREPARING FOR THE AP WORLD HISTORY EXAMINATION puts students on the FAST TRACK TO A 5! Written by experts in the field, this easy to use guide includes a diagnostic test, practice questions, and full-length practice tests. Designed to help AP World History students identify gaps in their knowledge and quickly fill them, the text includes numerous practice questions and tests to ensure mastery of each topic. 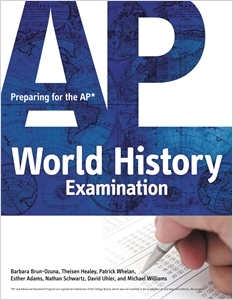 The text offers a general review of all the topics covered on the AP World History exam. Barbara Brun-Ozuna holds a bachelor's degree in history from Texas Christian University and a master's degree in history from the University of North Texas. She has taught AP European History, AP Human Geography, and Pre-AP World Geography at Paschal High School in Forth Worth, Texas. She began the AP World History program for the Fort Worth school district in 2001. She serves as a College Board consultant in World History and an AP World History reader and table leader. Patrick Whelan earned a bachelor's degree in history from Yale University. In addition to AP World History, he has taught AP U.S. History, AP European History, AP Art History, Humanities, Holocaust Studies, and English at Saint Stephen's Episcopal School in Bradenton, Florida. He has scored AP World and European History examinations since 1998 and has served as a College Boards institute and workshop consultant for AP World History. Theisen Healy holds a bachelor degree in history from the University of Michigan and a master of education from George Washington University. Courses he has taught include AP U.S. History; U.S. National, State, and Local Government; AP European History; Philosophy; Peace Studies; and Model United Nations; as well as AP World History. He wrote the Foundations review chapters, covering the period ca. 8000 B.C.E. – 600 C.E. He is chairman of the Social Studies Department at Walter Johnson High School, which has been recognized for having a higher proportion of its students pass the 2005 AP World History Examination than any other high school of comparable size in the world. Esther Adams earned a bachelor's degree in history and a master of teaching from the University of Virginia. In addition to AP World History, she has taught AP U.S. History; Global History; Senior Project; U.S. National, State and Local Government; Latin American Studies; and Model United Nations. She has graded AP World History examinations for four years, two as a reader and two as a table leader. In addition to writing the chapters for the period 600-1450, she served as coordinator for the writing of the first edition of this book. Nathan Schwartz has a bachelor degree in Social Studies/History Education from the University of Maryland and a master of education from Bowie State University. Before joining the Walter Johnson faculty, he was chairman of the Social Studies Department at Surrattsville High School in Price George's County, Maryland. He has taught both regular and honors sections of every core social studies course, and now teaches AP World History, AP U.S. History, and Model United Nations. His chapters review the period 1750-1914. he began as an AP World History examination reader in 2007. David Uhler has a bachelor degree in international affairs from George Washington University and graduate certification in secondary teaching from American University. A book editor before becoming a teacher, he has taught U.S. History, Modern World History, and Model United Nations, along with AP World History. Author of the chapters covering the period 1450-1750, he started reading AP World History examination two years ago. PART I: STRATEGIES FOR THE AP EXAMINATION. Preparing for the AP Exam. Taking the AP U.S. Government and Politics Exam. A Diagnostic Test. PART II: A REVIEW OF AP WORLD HISTORY. 1. Africa: Ca. 8000 B.C.E. – 600 C.E. 2. The Middle East: Ca. 8000 B.C.E. – 600 C.E. 3. Asia: Ca. 8000 B.C.E. – 600 C.E. 4. Europe: Ca. 8000 B.C.E. – 600 C.E. 5. The America: Ca. 8000 B.C.E. – 600 C.E. 7. The Middle East: 600-1450. 12. The Middle East: 1450-1750. 17. The Middle East: 1750-1914. 22. The Middle East: 1914-present. Practice Test 1. Practice Test 2.